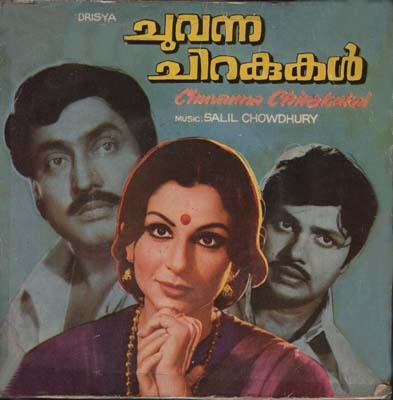 I was told that Chuvanna Chirakkukal means 'Red Wings'. Absolutely wonderful songs ! Those of you who have heard Dhananjoy Bhattyacharya's beautiful song "Noyone taar bhomraa kaajal kaalo " from the Bengali film "Pasher BaaDi" will definitely appreciate the wonderful arrangement of this song in "Neeyorumal". I am sure anybody who loves Salil's compositions just love Kishore's "Man kare yaad wo din" from "Aakhiri Badlaa" or its Bengali equivalent "Mone PoDe sei sob din" from "Antarghat". Well, just listen to "Parannupoy nee" by Yesudas ! There's a Hindi version of this film called 'Daisy' released in 1980. Most people have never heard of it. I managed to get quite a decent copy of the video. Just for the songs really. Most awful Hindi lyrics by Prem Dhawan.